Are you looking to increase your teams’ productivity while improving morale around the office and fostering an environment of friendly, healthy competition? Research has shown that the use of game thinking, game mechanics and competition to engage employees creates natural and healthy competition in the workplace. 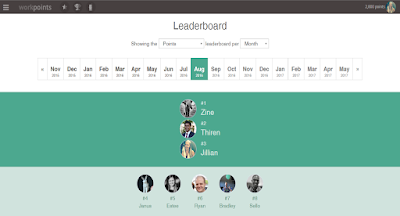 • Competition: There is no motivational technique more powerful than self-driven motivation, something that a publicly displayed leader board does in subtle ways. • Transparency: While transparency is great in terms of doling out credit, it can be even more effective in ensuring that there is no place for anyone to hide. • Morale: A great aspect of the leader boards it that they not only serve as standings, but have other associated morale-boosting features such as a ticker of new deals and an alert for breaking deals as well as serving as an effective reminder of past successes. Basically, gamification tactics in work environments have been proven to be effective in improving transparency, motivation and morale. Increase the competition amongst employees in your office and lift everybody’s performance by implementing our Workpoints leader board today! Lexi is part of our Business Development team here at Workpoints. She is our sales extraordinaire, our chatter-box and our ray of sunshine.